A&A Garage Doors supply and fit roller shutters, in Taunton and Devon. A&A provide a fully comprehensive range of roller shutters, security grilles and industrial doors in Taunton for domestic, commercial and industrial application. Our highly trained reputable and professional team of engineers are available to offer design, installation and fitting services as required. 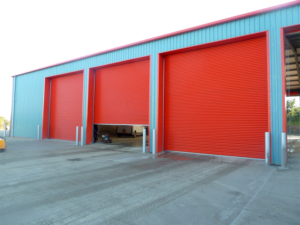 Having install 1000’s of industrial and warehouse roller shutters across Devon and Taunton A and A Garage doors have become one of the leading industrial roller shutter contractors in the South West. As you might image the price of any industrial roller shutter varies greatly from the size, operating mechanism, door features such as insultation and fireproofing will all contribute to the cost of a new industrial shutter. We offer a no obligation site survey to discuss what you need, review the existing opening and price up your industrial shutter – talk to us before you decide, call Taunton [te] today.